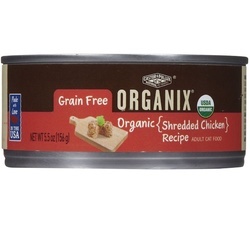 A shredded chicken dinner made with organic meats and vegetables.Ask any cat: it doesn't matter how good a cat food is if it doesn't taste good, too. That's why we've created new, grain-free, certified-organic canned foods that cats love, available in five delicious new flavors. Each delivers complete nutrition, including omega-6 and 3 fatty acids for healthy skin and fur, plus extra fiber to help control hairballs.Product Features:* Made with love in the U.S.A. from high-quality, certified organic ingredients* Omega-6 and 3 fatty acids help nourish skin and fur* Added fiber helps control hairballs* Tested throughout the production process to ensure quality and safety* No chemical pesticides, synthetic fertilizers, artificial preservatives, growth hormones or antibiotics in organic ingredients - ever!